First thing first, if you are not familiar with Clash of Clans, then it is a game where you build your own fort with gold and other resources. Drag and locate then a building is done. However, players need to collect the resources day by day from dawn till nightfall as they check in. Apart from building, troops are elementary in the game. You can train your troops with the resources, too. With you army, you can raid others’ town and vice versa. Once you are defeated, your town will remain stilled though you will lose some gold and some resources as well. 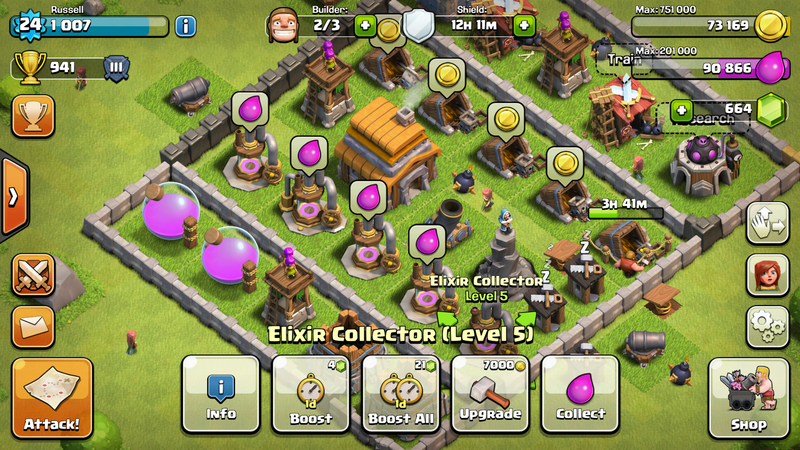 It sounds a simple game but actually Clash of Clans has much more to learn about if you want to be the winner forever. Don’t worry, we are here to help you out. Although Supercell, the producer of Clash of Clans, encourages you a lot to use gems in the tutorial, it is more rational to save them. Not only in Clash of Clans, the purpose of any casual free games is the premium currency system. Gems, diamonds, coins, are the only way to make profit of those producers. Normally, they will give away some premium currency for free and then show you the power of “money”. You can literally do everything with the premium currency in Clash of Clans: Speeding up production, buying resources outright… just name it and you are not alone, check the video:. But, here’s the point, you should never waste your gems in the wrong places. Builders huts are really needed in game and that the priority of your spending. Then, boosting your own production buildings is also a better choice than purchasing resources directly. In Clash of Clans, there is a sneaky way to save all of your elixir even if someone plunders your village and leaves you vulnerable. Basically if you queue more troops in your barracks and remember to maintain the queue as full as possible. Logging in every day to clean up your base can seem like a bit of a chore. It takes up one of your builders, and also costs a bit of elixir. However, you should make sure that you are cleaning up junk as soon as it appears. That’s something typical of Clash of Clans which let you login the game every day but trust me, it worthy keeping the habit. If you are really addicted to Clash of Clans, there is no doubt that you should try something else. Android emulators. No limitation of battery and data use. Playing Clash of Clans on PC with MEmu helps you get a competitive advantage using your mouse and keyboard on the larger screen to play! The game can now be downloaded worldwide officially from Google Play.Alternatively, if you would like to side-load the APK onto your laptop or PC you can install it from third party sites. Here’s the link to download. I recommend playing Clash of Clans on PC using MEmu Player. If you haven’t downloaded already, please install it here. Once installed you will see it on your home screen list of apps. Simply open it and the first launch will begin to download game resources! Once complete you will able to play Clash of Clans on your computer!